· Salty. Salty, a 7 year old Chinook active in agility, was diagnosed with a soft tissue sarcoma in April 2009. After a needle biopsy was not indicative of a lipoma, his owners had the lump removed from Salty's right hip and sent to a pathologist. Since taking wider margins surgically would damage the sciatic nerve, muscle and bone in the area where the tumor was removed, radiation therapy was advised. Following a consultation appointment with their personal vet (medical/holistic), and the Portland Veterinary Oncology Center, Lonna chose radiation. She writes: " I'd been spending every spare moment doing research on the internet and, in the process, stumbled across "Oliver's Story". It was extremely uplifting to find and read a story that, thus far, parallels our experiences with Salty over these past several weeks (although he did come through the surgery very well both physically and mentally). Plus, it was such a pleasure to have it fully explained in language and terms I could understand. I learned more from your story than all of the articles I had read, up to that point." · Oliver. Oliver was diagnosed with Malignant Peripheral Nerve Sheath Tumor” (MPNST) in August 2007. His owner, Michelle says: "It all began with a new lump. 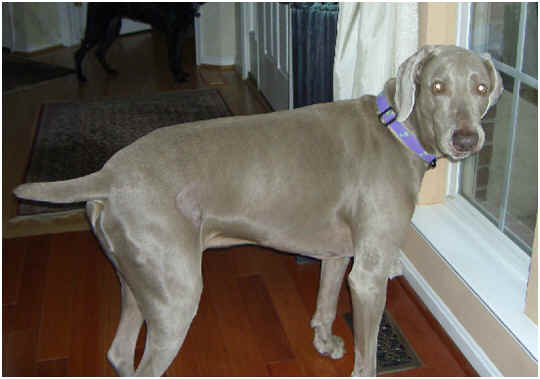 For our seven year-old Weimaraner “Oliver”, lumps and bumps were far from unusual. . . Just to be safe, we made an appointment to have it checked. Dr. G. did a series of needle aspirations on five lumps and only the “new” lump produced a bloody mixture rather than the fatty material that usually comes from lipomas. So, we made an appointment for two days later to have the lump removed and sent to a pathologist. Two days later, Dr. G. called and said 'I’ve been putting off calling you because I don’t know how to tell you this, except to tell you directly. Oliver has a Malignant Peripheral Nerve Sheath Tumor'. " With the help of Dr. G, Michelle conducted a thorough search for a specialists to advise her on appropriate treatment for Oliver, who suffers from severe separation anxiety. Michelle considered both radiation and surgical removal of the tumor, settling on surgery after much due diligence and deliberation, which she shares with you here on the website at Oliver's Story. You can read more of about this gorgeous guy Oliver at http://shelley-oliver.blogspot.com/. Shelley Holshey. · Jessie. 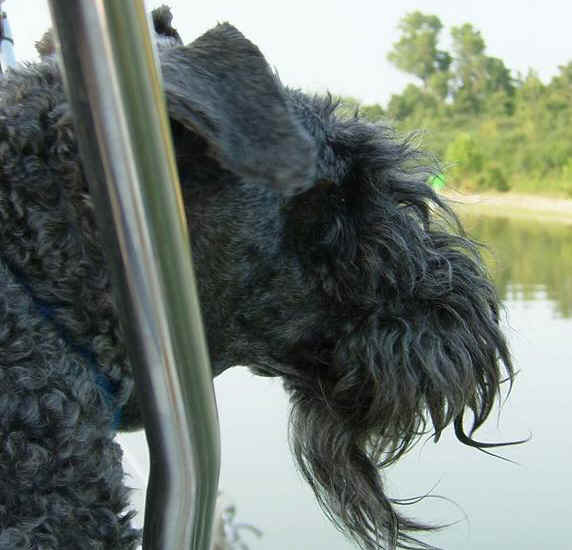 Jessie was 5 1/2 when diagnosed with lymphoma. Knowing she would not be cured, but might have her life extended, Nora chose VHUP. 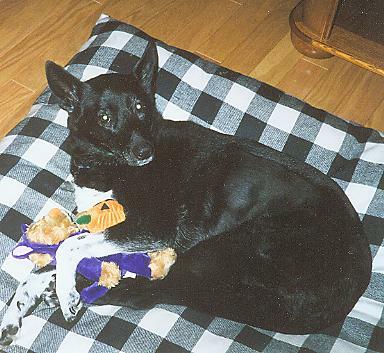 Jessie enjoyed going to VHUP and had good quality of life from her diagnosis in October 2005 until one month before she died in January 2008. · Hannah. Our four year old cat Hannah, was diagnosed with Lymphoma on August 30, 2004. She had been released that morning from an emergency care unit and taken to the University of Pennsylvania. The previous day Hannah had exhibited breathing problems which involved fluid in her lungs. It is now July of 2005 and Hannah is doing very well. She is playful, happy, and enjoys her human family as well as her companion cat. We were all devastated by Hannah's diagnosis, but we have been blessed by wonderful times with her during this past year and cannot say enough about the staff at Matthew J. Ryan. The first few months were scary because we didn't know what to expect. Hannah had some initial difficulty with diarrhea and her appetite is often a challenge. Our local vet was not supportive of our decision to treat her with chemotherapy. Within a few months of her diagnosis, we were fortunate to find a much more supportive local veterinarian. Hannah recently turned five, and is enjoying another season on our screened in porch. We have never regretted our decision to treat Hannah's cancer with chemotherapy, and continued to be thankful for the wonderful care and quality of life she has had since last August. Pat, blomepat@yahoo.com. 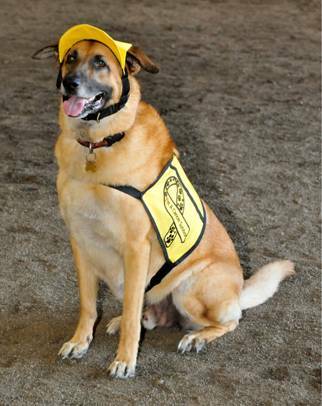 · Kirby was a 200 pound, 4 year old male English Mastiff when he was diagnosed with Lymphoma at VHUP. His first couple chemo treatments weren't working and they had to go to a more aggressive protocol. The second protocol was successful. He went weekly for treatments for approximately one year, then every two weeks for a time, then every three weeks, and finally once a month. 72 trips total. The chemo treatments were a success and he was determined to be in full remission. He went back just for checkups every 3 months for a while and then every 5 months. 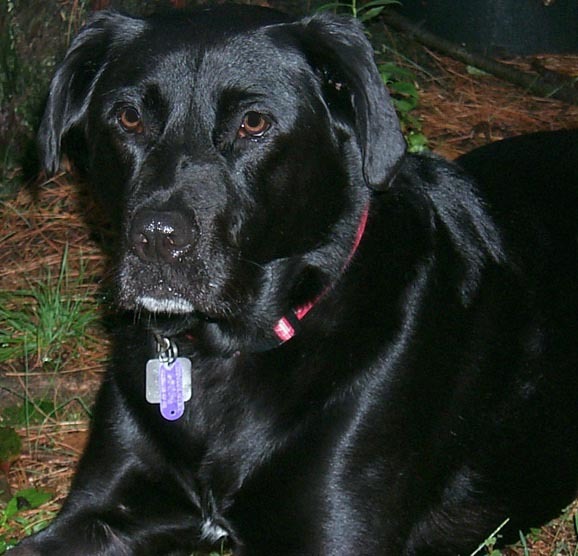 Kirby stayed in remission from his lymphoma until his demise at 9 and a half years old. A completely different form of cancer in his lungs is what eventually got him, requiring us to have him put down. 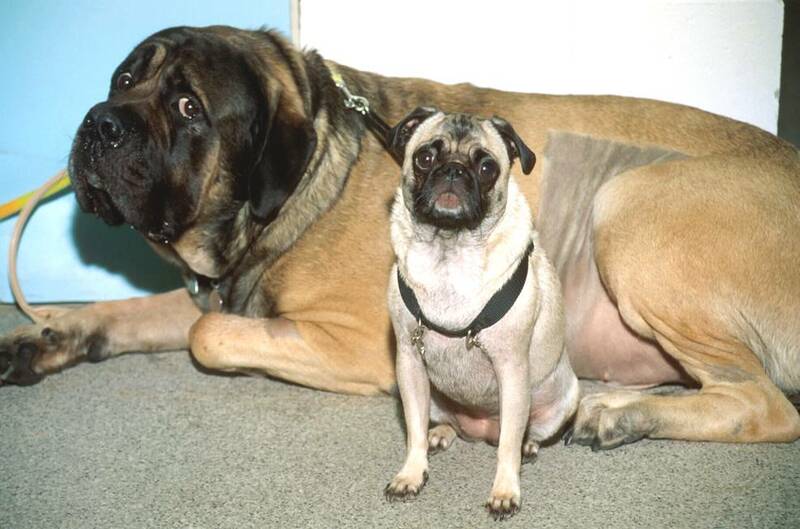 Considering the "average" life expectancy of English Mastiffs is 10 years and Kirby was diagnosed with cancer at age 4. . . he basically lived a full, happy and healthy life of "quality" time, which is what we wanted to achieve. Thanks to VHUP, its doctors (especially Dr. Baez), its nurses (Roxanne Bachman in particular), and all of its technicians and staff in general . . . we and Kirby were able to accomplish that goal. They are all to be commended and I can't begin to say enough good things about them. We, as humans, should be treated as well and with as much love as the pets get at U. of P. Our hat goes off to them. We would use them again in a heart beat if needed and would recommend them to anyone. You can't go wrong by taking your loving pet there. Ken and Fran, cinak@aol.com. · Bobo. When I turned 15 I was lucky enough to get an energetic puppy, he could jump so high it seemed he would jump over me. His name was Devil on his adoption paper but I said -- no way, something this cute can't be a devil. Bobo just seemed to fit. I watched Bobo grow up but he was still my baby. He was intelligent, mischievous, adorable and spoiled like no other living creature on earth. The only time my babies were in the care of someone else was on my honeymoon, but we called home a lot to check on them. When I was told that Bobo had cancer I was angry because I knew it was a mistake. I thought that the slowing down was just him getting old. He was still very sharp and alert, he couldn't be sick. Luckily we were guided to VHUP where I was scared out of my mind. I made him a promise from day 1, we would go through chemotherapy until he shows me that he's had enough. I told the doctors that and they understood. The first month was hell and I was ready to not put him through anymore, Dr. Overly asked me to give her one more chance and it was like a completely different dog. He put on weight and he was literally a puppy again. My neighbors would say cancer?? where?? I have to say that Bobo literally LIVED through his cancer. He ran around like a puppy again and you could see that he had no idea he had an illness. We did very well for almost a year and then, shortly after his 16th birthday, Bobo had enough. He wasn't handling the chemo well, he had changed, and finally he came out of remission. On August 12, 2003, we along with Dr. Overly, his favorite doctor, and Marissa, his favorite nurse, were all there to say good bye to my baby. I always feel good about knowing that Bobo had a great life and that I made his last year the best it could be for him. He was truly my baby. Shona Zimmerman, shonashouse@aol.com. · Koby was born in Switzerland, and was found to be a carrier for a rare disease that was being studied at UPenn. So when she was still only a kitten she was put on a plane and sent to the US. She landed in New York and was scheduled to fly to Philadelphia, but because of an airline rule about the maximum number of animals on a flight, she rode in a limousine from New York to Philadelphia. I would like to point out that, as her owner, I have neither been to Europe nor traveled to New York by limo. 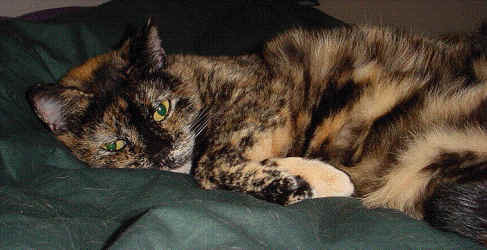 Koby was put up for adoption by UPenn in 1999 at age 7, and I adopted her. She was soon joined by another friend, and then two more after my wife and I were married. Our cat menagerie ultimately grew to 8 by the time Koby was diagnosed. Koby quickly became the mother figure for her 7 younger siblings. In April 2004 Koby was diagnosed with Acute Lymphoblastic Leukemia/Stage V Granular Lymphoma (a bone marrow aspirate was required to tell which disease it was, and she was not stable enough for that procedure when she was diagnosed). She was started on a chemotherapy protocol, and although she initially felt better, we put her to sleep in June of 2004 after she was no longer responding to treatment. Koby was an extraordinarily friendly cat who liked to be involved in the action, so sometimes she would get to hang out in a dog run in the treatment room instead of a cage, and we're told that one day she climbed up the 7' door and out of the run! 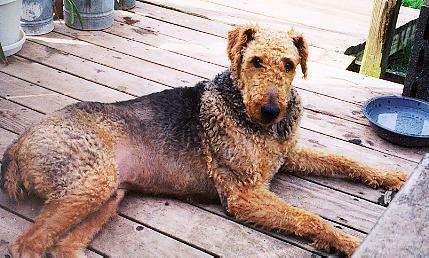 · Alex, our adopted Airedale, was diagnosed with lymphosarcoma on May 1, 2002, just before he turned 5 years old. The doctor told us that this type of cancer is the most treatable, but since Alex was already at Stage 5B, we were given a prognosis of 6 to 8 months. Alex loved going to VHUP. He responded well to the chemo and never knew he was sick. Alex received chemotherapy on a pretty much weekly basis. He went into a brief remission in August 2002. When he came out of remission, he received several different protocols, including Elspar, which has resulted in another remission. We had 14 1/2 months with him and we consider ourselves very fortunate. Alex died on Sunday, July 13 at VHUP. It was the only day he was sick but the cancer had spread to his lungs, and, the doctor felt, his spinal column since he could not stand up on his own. Dr. Skorupski came to the hospital when she learned Alex was admitted and she was with us all day. It was a terribly sad day for us but we knew we had done everything we could and Alex had been a very happy dog during his treatment. We cannot say enough about the wonderful people in the Oncology department at VHUP. They truly care about each and every patient. Diane Stevens. 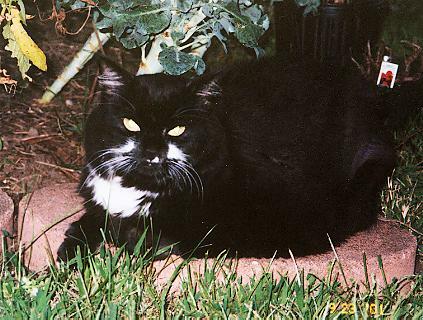 · Archie, my large bodacious 10 year old black and white long haired cat, was diagnosed with gastro-intestinal lympho-sarcoma, probably of a small cell variety, in September of 2001. He had been experiencing severe episodes of vomiting, diarrhea and lethargy with increasing frequency before and through the period of diagnosis. 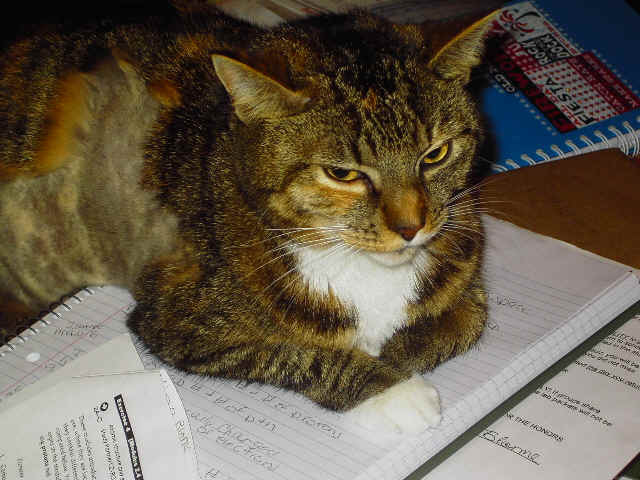 Archie responded well to the initial VHUP feline standard weekly protocol for chemotherapy and remained largely a-symptomatic with a good quality of life for eighteen months following diagnosis, though we did run through a number of chemotherapy protocols in that time. Archie died in April of 2003. The immediate cause of his death was not lympho-sarcoma. Pat Thatcher. 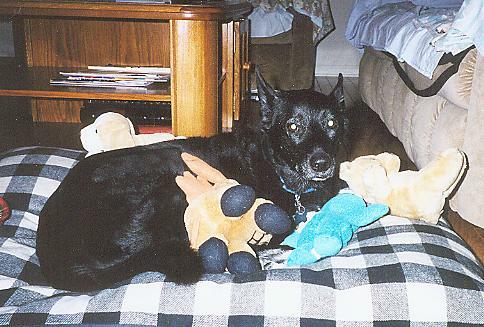 · Cody, a black lab, was diagnosed in 1999, with a malignant mast cell tumor (grade II) on his left hind foot. Because of the location, surgery could not excise all of the tumor and amputation was suggested. A vet at Ohio State University mentioned radiation, though at the time it was not offered in Ohio, and it is expensive (almost $2,500). Cody was given a prognosis with radiation of 80- to 90-percent cure rate. 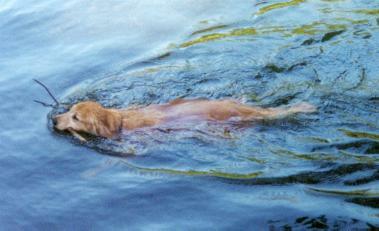 Cody, died August 5, 2004, at the age of 11, after many years of good health. In Fall, 2004, Cody's owner, Nicole Kraft, created Cody's Club, a charitable fund and support group to assist owners and their pets faced with mast cell tumors and radiation treatment performed at Ohio State University or any other 501(c)(3) (non-profit) treating institution. You can learn more about Cody's Club here on Pets with Cancer Lifeline. Click here to go to the Pets with Cancer Lifeline main page!